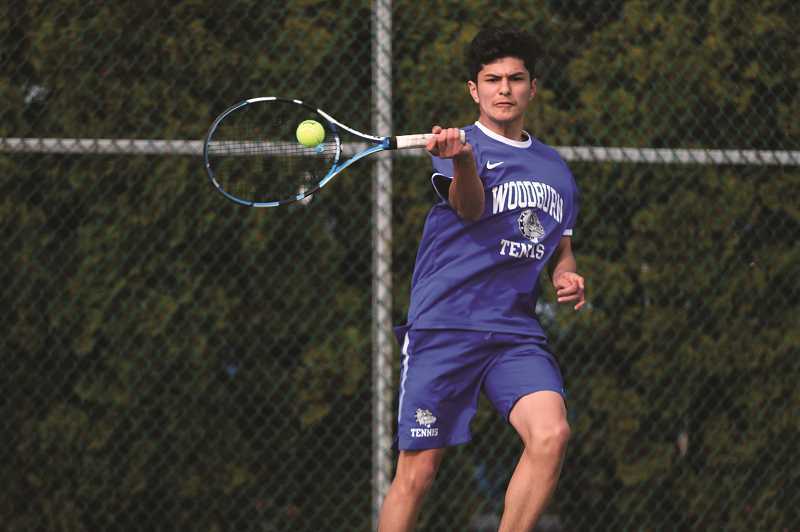 The Woodburn boys tennis team's victory over Estacada last week proved that every single point matters — no matter the individual score in each match. The Bulldogs hosted the Rangers on Wednesday, April 3 and the two teams played to a 4-4 draw on the court in match play. Woodburn swept the singles matches 4-0, while Estacada likewise took the doubles by a 4-0 margin. The tie-breaker came down to total games won, and in that regard, the Bulldogs held a 61-57 edge to claim victory. For head coach Tom Lonergan, it was an important point to nail home for the program's doubles teams players, who have struggled to get wins this season due to inexperience, yet still play an important role in the outcome of the matches. "They were aware of that," Lonergan said. "They knew they had to win some games." The winning margin came in the fourth doubles match, where Jesus Vasquez and Andries Manetieff lost 6-4, 6-1 to James Settje and Bryan Reyes, winning just enough games to tip the scales in Woodburn's favor. While the win was nice, it was more meaningful as a measure of the team's growth in recent weeks. It was the second match between Woodburn and Estacada this season, the first of which went to the Rangers by a resounding 6-2 loss. Ten days later, and the Bulldogs were happy to return the favor. I've seen a lot of improvement," Lonergan said. Most of those doubles players have never played before. They're coming on. To come back and tie them 4-4 and actually beat them in games, that's a big improvement." Also helping was the return of senior Roman Sonnik, who didn't play in the first game against Estacada, but took a 6-2, 6-0 win over Gabriel Martinez in No. 2 singles in the rematch. Sonnik was absent for much of the first few weeks of the season, and his presence gives the Bulldogs a solid one-two punch in singles play to go along with top-player Jonathan Swenson. Swenson took care of business on his side of the court, claiming a 6-0, 6-3 win over Cody Syring. Fellow singles players Job Aquino and Vlad Gridiner each beat their opponents 6-0, 6-2 to help give the Bulldogs the sweep. "Job is playing better," Lonergan said. "He's got more confidence." Swenson's victory is the continuation of a strong sophomore campaign in which the Bulldogs' top singles player has yet to lose a match this season. Swenson was the team's top singles player last year, and competed at districts as part of a doubles team. But with his steady improvement over the past year, Lonergan expects Swenson to stay in singles all season and challenge for a berth to the state tournament. "He's competing really well, and what I really like about him is he's coming up and he's balling well," Lonergan said. "He's figuring out how to win the points. He's got a good serve, good forehand, but he's doing other things also."